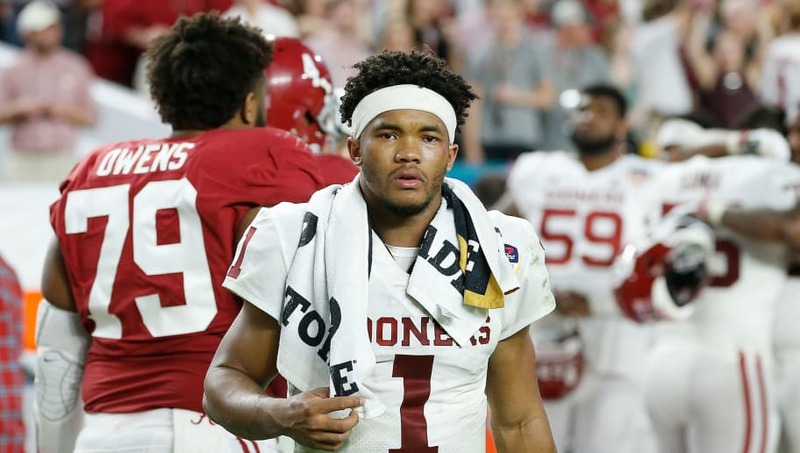 The decision is IN for ​Oklahoma star quarterback Kyler Murray, and unfortunately for Billy Beane and the Oakland Athletics, they've lost their former first-round pick. On Monday afternoon, Murray took to Twitter to announce he's "fully committed" to football and becoming an NFL quarterback. That's right, the man ​has chosen the NFL over the MLB. "Moving forward, I am firmly and fully committing my life and time to becoming an NFL quarterback," Murray said. "Football has been my love and passion my entire life. I was raised to play QB, and I very much look forward to dedication 100 percent of myself to being the best QB possible and winning NFL championships. I have started an extensive training program to further prepare myself for the upcoming NFL workouts and interviews. I eagerly await the opportunity to continue to prove to NFL decision makers that I am the franchise QB in this draft." Now that Murray has made it clear he's not playing baseball, look for NFL scouts to do even more homework on him, as they get ready to decide whether or not the Sooner is worth a top draft pick. Pundits already believe he's going to become the first athlete EVER to be drafted in the first round in the NFL and MLB. Though his size is a bit of a concern, Murray's athleticism and rocket for an arm could be just what a team needs come April.